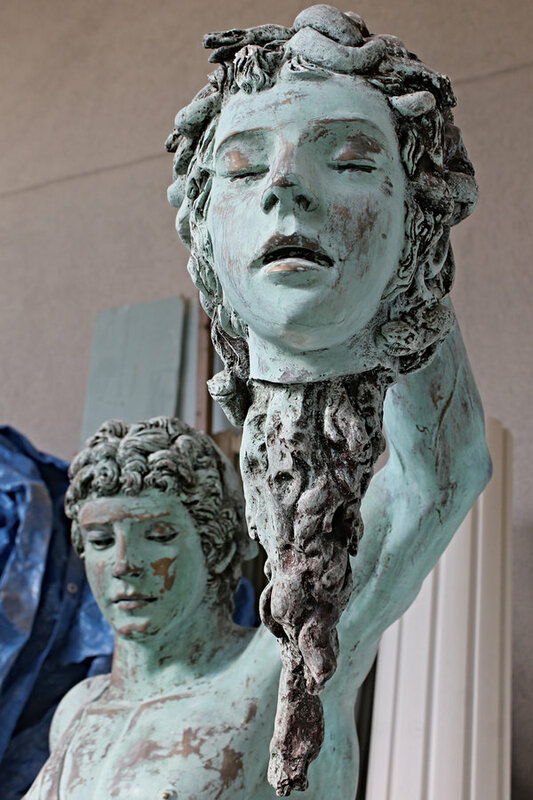 For many people in Secaucus, the most notable thing about the new art gallery opening on Paterson Plank Road next year will be the seven-foot-tall replica of Cellini’s bronze statue of Perseus with the Head of Medusa mounted above the front door. Since the male figure in the work is naked and without the fig leaf that adorns some classical statutes, the image is somewhat controversial. Because of the location of the statue, on a platform atop the front doors classic columns, it would likely take a telescope for anyone to see anything that might provide offense. What is more interesting, however, and very, very far from anything offensive, will be the displays of art inside the newly constructed gallery space inside. Simone, who has operated a jewelry store in this same location since 1995, has had a reputation for exotic jewelry and sometimes controversial window displays. In the aftermath of the Sept. 11, 2001 terrorist attacks, Simone decorated his window with life-sized figures of Bin Laden being hunted down by law endorsement. In a more endearing tribute came about the same time when he – a master jeweler – created a three-dimensional rendering of a photograph taken on Sept. 11, 2001 by the Record of Hackensack by photographer Thomas E. Franklin, depicting three firefighters raising the American flag over the ruins of the World Trade Center. Making use of a municipal loan program that allows businesses to borrow money from the city at no interest rate, Simone decided to renovate his business and construct what he calls “a world class” art gallery connected to it. While the loan from the city helped his with the reconstruction of the storefront, Simone had to sell him home in Secaucus to pay for the construction of the gallery. Like some of his previous adventures, Simone is very passionate, saying he needed to do this. He said many of the people who use the hotels are tourists from other parts of the world, coming to the New York area as tourists. “Why not give them quality art right here near where they are staying?” Simone asked. While putting the final touches on constructing the gallery, including levels below ground, a main gallery on the ground, and a more intimate location upstairs, Simone has already gathered art – much of this coming from Venezuela. “We have some of the best artist from there,” he said, noting that many of these artists studied in Europe’s most prestigious institutions. Some of the art is influenced by classic European artists such as Goya, but many of the artists on display reflect the culture which they grew up. The gallery was actually inspired by his wife, Yuny, who he said is much more involved in fine arts than he is. “I’m a jeweler, I do that well, but my wife knows about art,” he said. Along with having connection to many quality Venezuelan artists, the couple wanted to help these artists who are struggling because of severe negative economic conditions in their country. The Cellini-replica was designed by an artist in Ohio as a permanent fixture for above the gallery door. “I know people will talk about it,” he said. Maria Helena Rivero is serving as curator for the gallery, She recently served a curator a show at Sotheby’s Institute of Art in New York, but as served as marketing specialist and creative director for a number of arts organizations in the New York Area. She was art production manager for Un Mundo Sin Mordaza in Caracas, Venezuela where she co-curated and organized the first Art Show of the activist campaign “NoEstasSolo” and exhibited more than 50 artworks of Venezuelan fine artists and other programs. “We want to bring Venezuelan art and old art here for a new experience that will highlight Venezuelan art and culture,” she said, noting that much of what will be on display makes use of a number of techniques, classical and others, but generally uses a rich variety of vibrant color and experiments with light. The big draw is Alexis Rivas, arguably the best landscape artist in Venezuela. “Once we got him, other artists wanted to come here, too,” Stefano said. The artwork includes sculpture, painting, and other works. Stefano said the jewelry store and gallery will open within the next few weeks. Creations by Stefano is located 1261 Paterson Plank Rd. for more information call 201-863-5806.